I can offer you a broad range of private, individual PADI dive courses and dive education from the first breath under water (PADI Open Water Diver) up to the professional PADI Divemaster level. Furthermore I can join you as your private dive buddy and PADI Instructor for your holiday dive trips. I have worldwide dive experience in different diving conditions. I offer my services worldwide at the location of your choice. I can come to join you during your stay at your favorite holiday destination or travel with you, for example on live-aboard diving trips. You are also very welcome to visit me in the Philippines on Boracay or in Bali, Indonesia depending on the dive seasons. If requested I can also organize your stay according to your wishes and needs. I´m PADI Master Scuba Diver Trainer Instructor, authorized to teach all PADI dive courses from Open Water Diver up to the PADI Divemaster and Master Scuba Diver levels. This is where it starts. Take your first breath under water. The PADI Open Water Diver course is the world’s most popular scuba course. If you’ve always wanted to learn how to scuba dive, discover new adventures or just enjoy the freedom and the fascinating beauty of the submarine world. Feel safe and comfortable through the knowledge and training that you will gain during your PADI Open Water Course and enjoy the freedom under water. You´ll need 4 days to absorb the PADI Open Water Diver course in a relaxed way. The course is split into 3 parts. During the first phase of your PADI Open Water Diver scuba certification, you develop an understanding of the basic principles of scuba diving by watching the 5 chapters of the PADI Open Water Diver video. You briefly review what you have studied in the five knowledge sections with mw as your Instructor and take a short quiz to be sure you’re getting it. At the end of the course, you ’ll complete a longer quiz that makes sure you internalized the concepts and ideas. You and me as your private PADI Instructor will review anything that you don’t quite get until it’s clear. This is what it’s all about – diving. You will develop and train in basic scuba skills in a pool or pool-like conditions in shallow water. There are five confined water dives, with each building upon the previous. Here you’ll learn and practice all necessary scuba diving skills, from setting up your scuba gear to learning how to use and get comfortable with it. You’ll also practice emergency skills that will make you able to handle difficulties while diving in a safe and proper way. You´ll be able to help yourself and your buddy if problems appear. After this training you´ll feel safe and comfortable through the knowledge and experience that you gained during your confined water training. These skills will enable you to enjoy the freedom under water without worries. After your confined water dives, you will continue learning during 4 open water dives with me as your private PADI Instructor at a dive site. This is where you will fully experience the underwater adventure at the beginner level. You may make these dives near your home or at a more exotic destination while on a scuba vacation. The training is based upon demonstrating that you know what you need to know and that you can do what you need to do. This means that you progress at your own pace; faster or slower depending upon the time you need to become a confident scuba diver who dives regularly. All offered PADI dive courses can be embedded in the Ergo- therapeutic Different Therapy concept. To get more comfortable with the underwater world you will be completing five adventure dives under my supervision as your PADI Instructor. Two of these dives are mandatory; the Deep Adventure Dive and the Underwater Navigation Adventure Dive. The other three dives that you complete can be chosen from a wide range of Adventure Dives. One reason you’ll love the PADI Advanced Open Water Diver course is that you can choose from 15 types of Adventure Dives to complete your course. If you’re looking to build your confidence and gain more experience, this is the next step. How much you learn while taking your Advanced Open Water Diver course with me will depend on your own interests. The PADI Rescue Diver course theory covers a wide range of topics including; The psychology of rescue, recognizing diver stress, accident management, assisting responsive and unresponsive divers at the surface and underwater, equipment problems, oxygen delivery systems, missing diver procedures, responding to diver emergencies and in water rescue breathing. The PADI Rescue Diver course is designed for anyone who wants to learn how to prevent and manage diving emergencies. The course broadens a diver's awareness and improves your skills and confidence. The PADI Rescue Diver training is one of the most challenging - sometimes demanding - and therefore most rewarding courses. The subject is serious but the training contains a lot of fun. After you complete the in water training portion of the course, we will complete 10 rescue exercises in the open water, either with or without initial skills practice in confined water. Finally, you will participate in two Rescue Diver scenarios in open water. The conclusion is to be a safer diver and to be prepared. Increase your self-confidence with knowledge and training with the PADI Rescue Diver course. Did you fall in love with diving? Do you want another lifestyle that changes your life? Do you want to travel the world and make scuba diving to your profession? Then the PADI Divemaster course is the right course for you. Your adventure into the professional levels of recreational scuba diving begins with the PADI Divemaster program. Working closely with me as your PADI Instructor. In this program you will expand your diving knowledge, hone your skills to the professional level and increase your confidence. PADI Divemaster training develops your leadership abilities, qualifying you to supervise diving activities and assist instructors with real students. PADI Divemaster is the prerequisite certification for both the PADI Assistant Instructor and PADI Open Water Scuba Instructor certifications. During the PADI Divemaster program, you learn dive leadership skills through classroom lessons, independent study, and practical dive training. You complete water skills and stamina exercises, as well as training exercises that stretch your ability to organize divers and to solve problems as well as help others to improve their scuba diving abilities. Then, as a PADI Divemaster you’ll use these attributes to lead, mentor and motivate other divers and to experience the joy of seeing them transformed by the majesty of the aquatic realm. 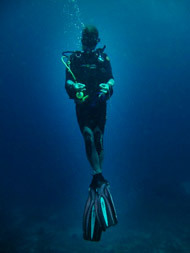 Accompany student divers during Adventure Dives or Specialty training dives. Conduct the PADI Seal Team Skin Diver Specialist Aqua Mission. All professional options of the PADI education system are open for you as a PADI Divemaster. Your way as a PADI dive professional is only restricted by your interests and motivation. Get ready to dive the world! This PADI-No Fear Diving specialty course is especially created for people with fears and concerns in context with scuba diving & water. The PADI- NO FEAR DIVING specialty course aims to appeal to divers who feel insecure under water for various reasons. It creates space to speak about problems, dispel misgivings, rebut and eliminate stress and as a result, to reduce discomfort, anxiousness and fear. This course puts you, diver himself at the center of attention, supervision and reflection, with all Your individual & personal wishes, handicaps, needs and goals. The No Fear Diving is your customized scuba diving course! You as a Client decide which personal emotion will be one of the topics in your client centered scuba course. Personality, individuality and customer-centricity are the attributes of No Fear Diving! No Fear Diving is a scuba dive course and not therapy! It can however be part of an individual therapy in the Ergo-therapeutic concept of Different Therapy, like every other PADI scuba diving course.